For a company that was initially known as some of the middle to low end brand for a while, ZTE has really turned their boat around and the brand has become well known for some excellent phones. The Axon Pro came out and I was thoroughly impressed. ZTE's newer catchphrase of "Tomorrow never waits" may be true for what they're bringing out, but after pre-ordering this, it sure seems like 'tomororw' will take a long time to get here! (it's stating that it'll launch/be available July 27... and then maybe a few days for shipping beyond that - don't forget to ensure you choose something other then Canada Post... just in case). 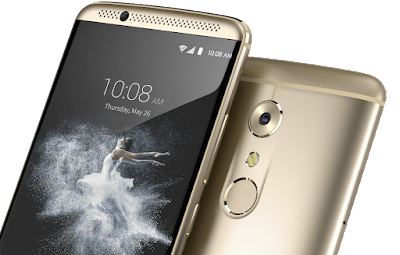 TORONTO – July 13, 2016 –– ZTE, the fourth-largest smartphone manufacturer in North America, announced it is accepting online preorders of the Axon 7 smartphone today on NewEgg.ca. The Axon 7 is the first Android smartphone to break away from other flagships with specs that outperform rivals at an unbeatable price of $529.99 CAD. The Axon 7 delivers the best audio and visual experience for VR applications. It comes equipped to support Daydream, Google’s mobile VR platform and will be Daydream-ready in the Fall of 2016. With two dedicated sound chips and enhanced software, professional third-party testing proves the Axon 7 headset and speaker output are significantly more powerful than the competition. Listeners will experience better sonic quality at lower listening levels and increased headroom to experience louder bass sounds and higher dynamic ranges. The 20-megapixel rear camera is equipped with dual image stabilization to prevent blurred images when capturing real life moments. Features such as Live Photo generate animated images that can be shared via text, email and across social media. Beyond the high quality camera, photo editing options including filters, stickers, text bubbles, and more, provide new levels of fun and personalization. The Axon 7 was designed in North America with the help of industry leading design experts from Designworks, a BMW Group company, which ensured the phone would look and feel premium at every angle. Thanks to a continuous curve, the phone is noticeably smooth and luxurious to hold. The design is elevated with shiny metal edging that stands out while highlighting some of the phone’s best features. Powered by the 2.15 GHz Quad-Core Qualcomm® Snapdragon™ 820 (MSM8996) with integrated Qualcomm® Adreno™ 530 GPU, the Axon 7 delivers power and performance when you need it. Capabilities such as taking a screen capture with one finger and one of the industry’s most responsive fingerprint sensors gets you from point A to point B efficiently. The big, bright AMOLED display is noticeably crisp whether looking at the screen head on or from an angle. A multitude of themes take full advantage of the WQHD display with high quality graphics that can easily change the look of the phone in an instant. The dual-SIM slot allows two carrier SIMs to be used in the Axon 7. Different carrier networks can be independently tasked to manage calls or data, and can be switched at any time. This highly convenient capability is great for overseas travel, waiting out a contract, or in situations where network reception is weak. Provided in-box, the Axon 7 comes with a clear phone case, screen protector, Qualcomm® Quick Charge™ 3.0 USB-C type 3 phone charger, and premium in-ear headphones. The Axon Passport 1.0 warranty comes standard with any Axon phone purchase to keep you covered through whatever life throws your way. The ZTE Axon 7 is available for pre-order today from NewEgg.ca for just $529.99 CAD, with shipping starting on July 27.